Street art has a certain association with the urban context. After all, ‘the streets’ is a shorthand reference to life in the city. But recently I stumbled across a painting that for all intents and purposes could have been a beautiful landscape intervention and yet, because of its positioning, could also easily be interpreted as a form of street art. On the exposed inner trunk of a chopped down pine tree someone had painted patterned blue and white horizontal stripes. Now, even though there was a clear intention behind the meaning of these stripes let’s just put that aside for a moment and deal with the object as it is. After all, careening along this country road at 100 km/h and glimpsing the painted tree along the fence line you’re first taken with the striking impact of the scene before anything registers about why someone would have painted these colours, this way, at the time they did. And as that time of creation falls further back into the past, the obviousness of that original intent dissipates. In a place where the streets are intercut into the environment, as opposed to a city where the streets actually are the environment, the way in which an artwork placed on, over or next to the street (or road) is going to have different influences and outcomes. The single biggest factor in this regard would have to be the way in which an audience receives the art. In a city context, this is almost always going to be on foot, walking by, with the image in competition with a vastness of other human signs and symbols. 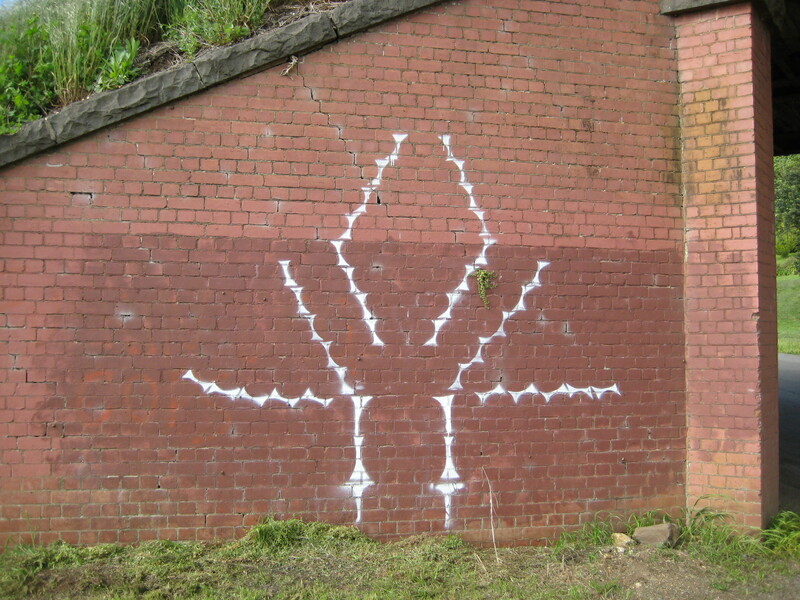 In a country context, the way an audience might commonly engage street art (maybe it should be road art?) is through the framed windows of their vehicles, moving at speed through a landscape dominated by fields, trees and sky. This tree painting reminded me of another street art piece I often drive passed on East Street in Daylesford. 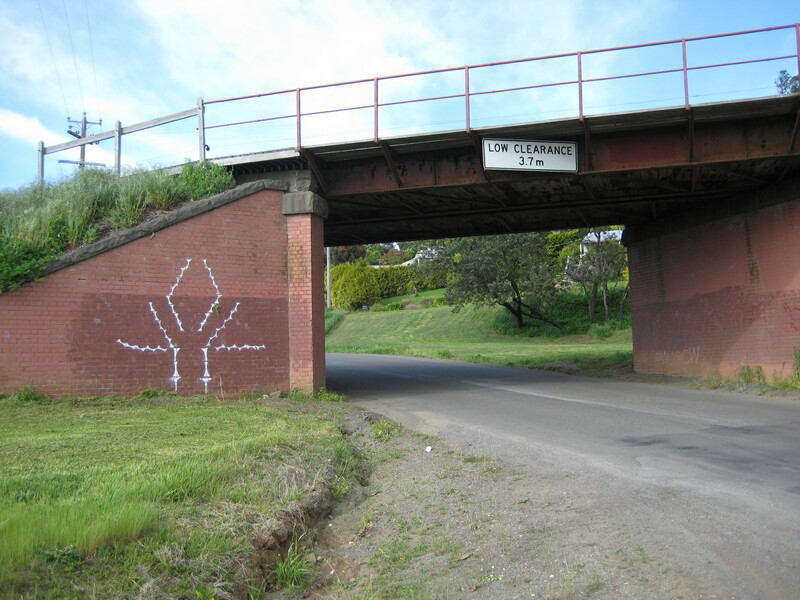 Stenciled up on one side of a brick railway bridge, far from the centre of town and in a place very rarely used by pedestrians, is a white abstract pattern not dissimilar to a 8-bit computer alien from a 1980s Atari video game. It’s always puzzled me as to what it represents and why someone would have placed it on this wall, where mostly only locals would be driving, and not somewhere more visible to pedestrian traffic, like a laneway in town or on the side of a building. In contrast to some of the hideous property markers in the area (giant people made out of straw bails, complete with costumes – apologies to the owners of said monstrosities) that also constitute some sort of variant of street art in the region, these examples depict highly graphic, highly composed abstract markings. And as such are distilled of any immediately obvious content and can be seen as simple visual pleasures. Since noticing these particular pieces I’ve found my eye scanning about the landscape for more examples. Suddenly all the roadside detritus has taken on a whole different feel to it. Chopped trees, piled rocks, faded signs – they’re all starting to look like weird artworks.